Are GPs Taken For Granted? Is it a case of GPs now seen as a convenience or do they still represent the fabric of local communities? The UK has its issues of increasing patient demand, reduced resources, surgeries that are not fit for purpose and the problems of staff recruitment. ‘The Family’ or ‘Hedge Fund’? The NHS is a huge cost to the state, hence the government looking for ways to reduce the cost. For instance, they determined that GPs were too expensive for the out of hours service, so looked at more cost effective provision and introduced a GP service who had no association to the community / family based doctoring service. 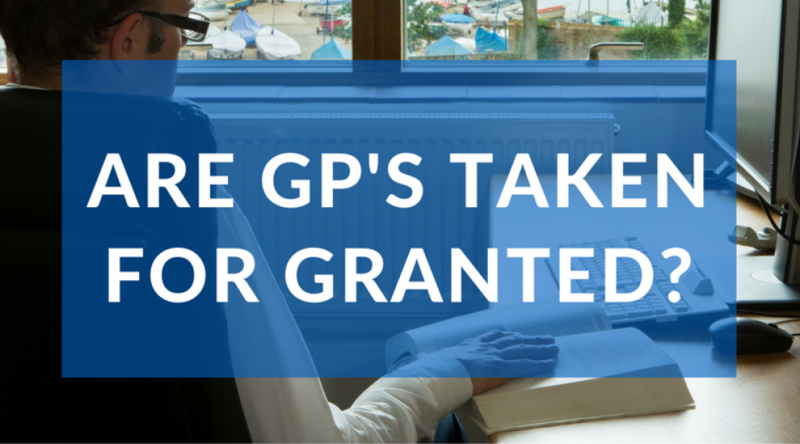 We used to have local GPs who were part of the community and on a rota basis. They would be on call to assist and help families in their hour of need. The scenario we have today is as a result of someone from the government who knows the cost of everything and the value of absolutely nothing determined that they could save money by taking a core service away from the local community and provide it from a central core. GPs have been bought in from out of town and in some case the country to fulfil a need that is more ‘cost effective.’ It destroyed what had grown and developed over the years. Is it true to say that today we have begun to treat a Doctors surgery more as a commodity, a right, an expectation like a widget on a factory line? We are very much in danger of this attitude becoming prevalent in our society, as the service is free at the point of delivery. Things that are free are rarely valued but demanded and thus could conclude with the disintegration of the family GP service. The alternative is to be replaced by a conglomerate run, hedge fund funded, medical provision and all family GP provision removed. Is this the way that we want a GP service to be seen? A faceless, turn up, get paid and go away approach? With no family connections and interest in community matters and the people of the local community in which they work. We need to look at what we value in society. We need to identify if we choose to have the ambulance service, fire service, police service and hospital service and GP service all from the turn of the same tap. The fire and police hospital service are all state employees and trained and equipped to interact within our communities (hopefully on an infrequent basis). A GP is a self-employed independent business minded commercial individual, who generally lives and works amongst their patients. Where Does This Put The GP? Are we not really bothered whether the service is delivered from a hedge fund taking the profits out by employing the cheapest solution rather than any profit paid in wages, to a highly skilled and interested locally based GP, whose income will circulate in the local community, just as long as we are mended but not interested in the personal aspect? Do you value having a family service driven or hedge fund profit driven Primary Care provider? Do we look at the GP as someone who has the constant and enduring impact on our life requirements from cradle to grave? A family service within a community presents a personal service with a connection. More importantly, providing families with a service from other families also understanding the nuances of that community. GPs cannot take on another set of broken promises from ministers and be let down by promised funding injection that never happens. Are GPs taken for granted? We now live in a more consumerist society that talks about rights but says very little about responsibility. We treat provision from the NHS as though it was a 24-hour supermarket. We are outraged if it is not there for our convenience. Our complacency over the years of not investing in the ethos and well being of our exulted medics is now coming to the fore. A GP once had a high-perceived society value. As I have highlighted before, skill sets were built on the importance of a ‘bedside manner’ with a local population. This was a case of wanting to deal with the local community and live a life amongst them. The trials and tribulations of health needs is no longer valued as it once was. This is not only in terms of money but also in status and respect of the skills that they bring to a community. Times have certainly changed. A review by University College London into the proficiency of overseas doctors in the UK identified that 50% lacked the qualifications they are expected of domestically trained practitioners. The NHS claim that we focus on a country on community based care, yet many of the doctors expected to provide it are not skilled enough to do so. Change is good as it keeps us from stagnating and brings fresh ideas. It challenges our beliefs and society structures. What is it we stand for? We are at risk of treating this scarce and valuable resource of the family GP as a chattel, to be bought and sold. It is not. It is a person whom we as a society have to bring into our homes to respect and be aware they have a choice if they chose to be here. They could do anything with their life and they have, by the very nature of the training to a very high level of education we must regain our appreciation of their choice to not be an investment banker or a hedge fund operative. They have chosen to be a GP who gives his or her emotion and skills to look after you and your family. Is it wrong that we provide them a decent work environment and make the access to that easy to encourage them into our lives and to work amongst us? We are in danger of facing the destruction of the family GP service, to be replaced by hedge fund commercialism. We believe in a circular way of working. Jerrard, Keats & Wolley work with medical centre developer, Charles Higgins Partnership, who use British people’s pension money to fund high quality fit for purpose GP surgeries. British people who pay into their pension plans have their money invested in the medical centres and with an income from the NHS for the provision of the building this is going back to pay them their pension. We think his a solid way to use money for our population staying in the county providing for the community in a wholly circular fashion. Here at Jerrard, Keats & Wolley we are collating feedback from communities with our annual survey ‘How Do You Value Your GP?’ campaign. If you are a patient from a GP surgery, it would be kind if you could spend a very short amount of time and give us your feedback with our very simple online questionnaire. We will share with you the feedback if you send us your email address and you will be entered in a draw for a bottle of Champagne (week commencing 19th December). Click here to send your email address.